My favorite part of a salad is the vinaigrette. Don't get me wrong. I love greens and vegetables and try to eat at least one huge salad per day. 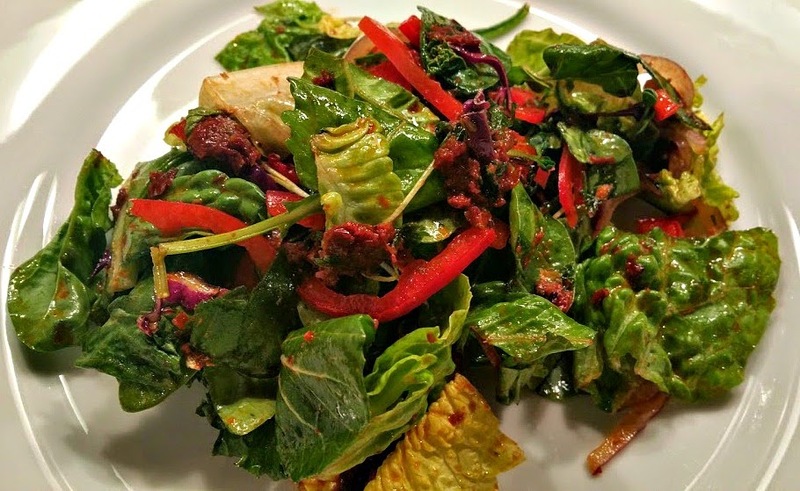 But a well-made vinaigrette pulls everything together and makes a healthy choice delicious. I am always surprised (and a little bit sad) when I see the huge selection of bottled salad dressings on market shelves. People pay so much money for an item that is chock full of preservatives, lower quality ingredients and often loads of sodium and sugar (read the labels...you will be shocked.) Homemade vinaigrettes are fast, easy, delicious and much better for you because you control the ingredients. Keeping a well-stocked pantry of excellent oils like olive, sesame and walnut, along with various vinegars, seasonings and mustards ensure you are always just a few minutes away from a perfect & healthy vinaigrette. 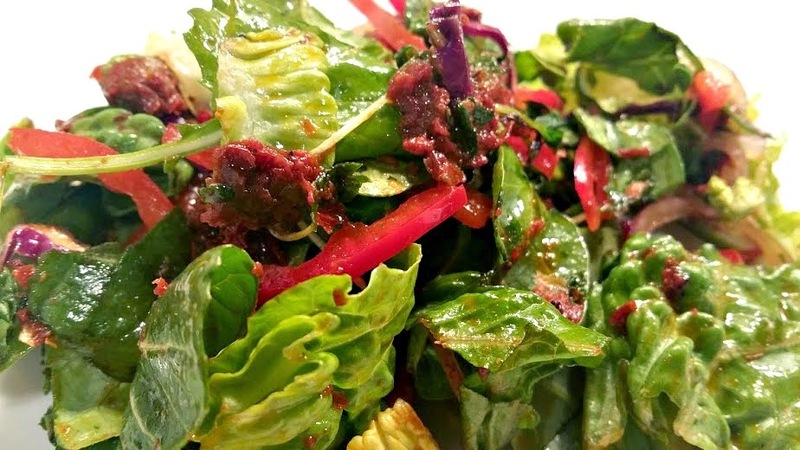 Today I am sharing a recipe for a vinaigrette featuring sun-dried tomatoes. I use it to dress a simple green salad or one with greens, roasted vegetables, and grilled chicken. Double or triple the recipe...it keeps for two weeks in the refrigerator. In the bowl of a food processor add sun-dried tomatoes, vinegar, capers, red pepper flakes, sea salt, pepper and water. Pulse until smooth. With machine running, slowly add oil. Process until emulsified. Taste and adjust seasonings if desired. Set aside. 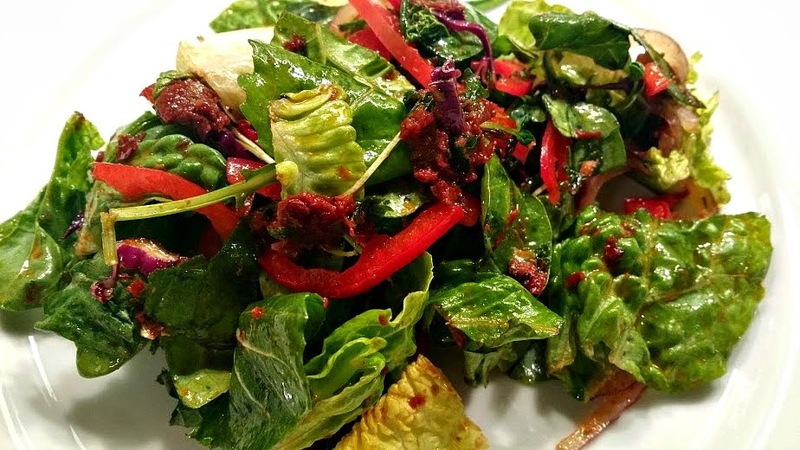 Add greens, red pepper and onion to a large salad bowl. Toss. Add 3 tablespoons vinaigrette. Toss to combine. Add additional vinaigrette if desired. Do not over dress the greens. Springtime means the start of sensational side dishes made from fresh, just-picked produce and this week at Food Network we are celebrating Salad Greens. Do you have a favorite salad recipe? Share in the comments section and/or link to your blog if you have one. And be sure to check out the delicious sounding recipes from my blogger friends and Food Network. Perfect! I am picking up the fixings for this tonight and having it for dinner. Thank you Rocky Mountain Woman. I hope you enjoyed the salad!